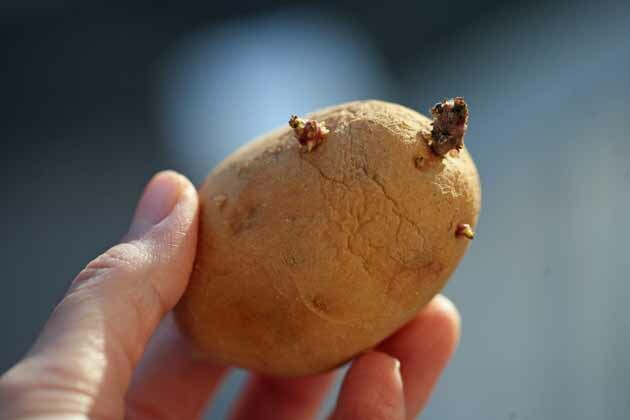 The potato is the world’s fourth largest food crop. It is a starchy, tuberous crop with an ideal carbohydrate to protein ratio. 73% of its protein is easily utilized by humans, in fact, only eggs rank higher at 96%. In addition, potatoes also provide a significant amount of minerals and vitamins. There are many ways of growing potatoes in the home garden. Over the past few years, I’ve tried a few. Although I won’t necessarily classify potatoes as part of the group of easiest crops to grow, they are not too hard either. And they are very well worth the effort not only because they are tasty, healthy and filling, but also because, if stored correctly, they can last a long time. They are the perfect crop for the root cellar. If you manage to grow enough potatoes in early spring, you can enjoy homegrown (hopefully organic) potatoes year round. There are many verities of potatoes you can grow. Red on the outside, white on the inside (Red Norland), purple on the outside, white on the inside (Purple Viking), golden on the inside and outside (Yukon Gold), large potatoes, small potatoes, or fingerling potatoes, and the list goes on and on. I purchase my seed potatoes from The Potatoe Garden. Last year I purchased Yukon Gold and Kennebec potatoes. They arrived on time and were very clean. I saved enough seed potatoes from 2015 crop so I don’t need to purchase anymore this year. You can find seed potatoes at your local garden store as well, but online sources like The Potato Garden will have a much larger verity of potatoes to choose from. Before we go into details about how exactly you plant and grow potatoes, you should know that there is more than one way to do it. 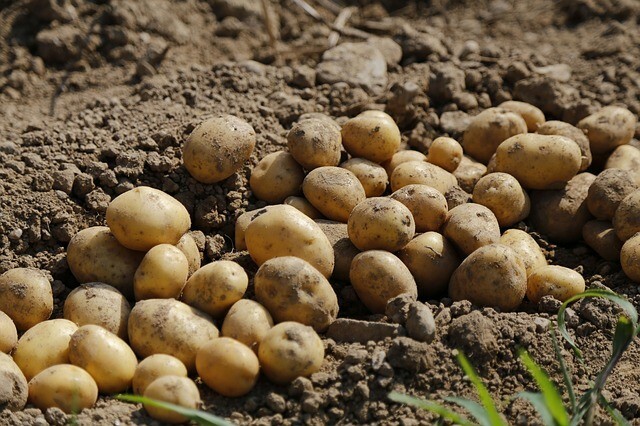 In fact, there are many methods of growing potatoes, but the same principle stands for them all: in order for the potato plant to grow many tubers, soil needs to be hilled around the plant as it grows. Rows – as you can see in the picture above, you can grow potatoes in rows. Farmers will usually space their rows 30”-36” apart, but the home gardener can get away with 20”-26” apart. The important thing is to make sure you have enough soil between the rows to hill the plants as they grow. Dig a trench 6”-8” deep and plant (we will talk about the right way to plant in the next section) your potatoes 12” apart. Note – I will link the next methods to a picture on Pinterest so you can have a visual. Bins – you can grow potatoes in large bins like garbage bins or the bins you would store Christmas decorations in. Make sure to drill a few drainage holes in the bottom before you add soil. When I grew potatoes this way a couple of years ago, I also placed each bin on a couple 2x4s so there is space between the bin and the ground so water can drain easily. If the soil is too wet, the potatoes are going to rot. Once the bin is ready, add about 8” of soil on the bottom, plant 2 or 3 plants in each bin and as the plants grow you keep adding soil until the bin is full. Grow Bags or Garbage Bags – you can grow potatoes in grow bags like those ones or in garbage bags. The grow bags are made from fabric and can breathe, drainage will be much better in those as well. I never tried garbage bags, but you definitely going to have to make sure water can drain and that the bag doesn’t fall over. If anyone have tips on how to do this please comment bellow. The principle will be the same like with the bins. You add a little bit of soil, plant the potatoes, then add soil around the plant as it grows. Wooden Potato Box – this is another cool way of growing potatoes. You make a square frame from 2×6 boards. Place a 33” tall 2×2 upright in each corner of the frame from the inside. You place this in your garden and plant the potatoes inside, then as the plants grow you add another layer and another layer of 2×6 to hold the soil you add around the plants. 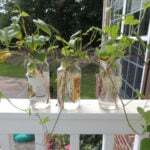 Wire Towers – this is the method I am going to try this year since I have so much wire laying around. You simply make a wire cylinder, place it in your garden, plant the potatoes on the bottom and as they grow you add soil. Tires – old tires are easy to come by on Craigslist. You place one tire on the ground, fill it with soil, plant the potatoes, and as the plants grow you add another tire and more soil, then another tire and more soil. I would plant only one plant in a regular size tire and probably go no more than 3 or 4 tires high. Hay – this is also called the no-dig method of growing potatoes. Basically, you hill the potatoes with hay instead of soil. Space the potatoes on top of your garden soil. Instead of burying them you just lay them on top of the soil and then cover with 6 inches of hay. As the plants grow, you add more hay around them. When they are ready to harvest, you just move the straw and get your potatoes. Growing this way makes it easier to harvest but you have to make sure your potatoes don’t get dry since the hay doesn’t hold water like soil does. Also, I’ve heard that the potatoes don’t taste the same, less earthy since they are not in contact with soil, but I never tried growing potatoes this way so I can’t say for sure that there is a difference. I probably left a growing method or two out. There are many ways of growing potatoes and one can have fun and get creative as long as the principle of hilling is kept. If you know of another way of growing potatoes, please let me know in the comments. When Your Potatoes Arrive – if your potatoes arrive in a box, open the box for better air circulation. Even if you got them from the local nursery in one of those bags that have many holes, I still like to remove them from the bag and set them in one layer on a counter or a wide box. If you can’t plant right away, you can keep seed potatoes at room temperature for a month or two. If you have to store them for a longer period, they have to be stored at 4oF. If your seed potatoes already have sprouts, try not to break the sprouts. If you do break the sprouts it’s really not a big deal since they will regrow. 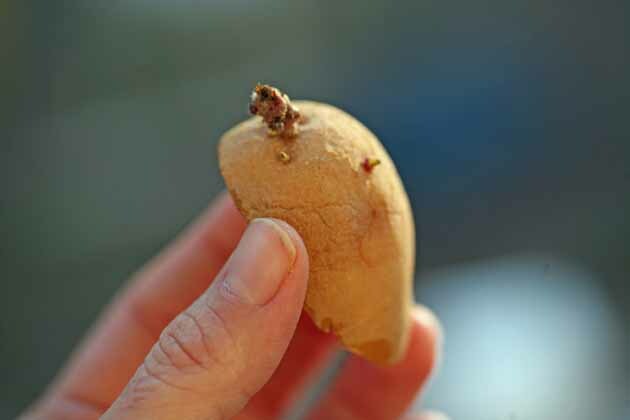 Pre-Sprouting Seed Potatoes – if your seed potatoes arrive without sprouts on, you can re-sprout them before planting. This, however, is not necessary, you can plant seed potatoes without pre-sprouting. To sprout potatoes (also called greening), set your potatoes in a single layer on a counter, a box, or a flat and place in a warm room (70F) where the light is medium in intensity. Soon you’ll see little sprouts starting to grow from the eyes. 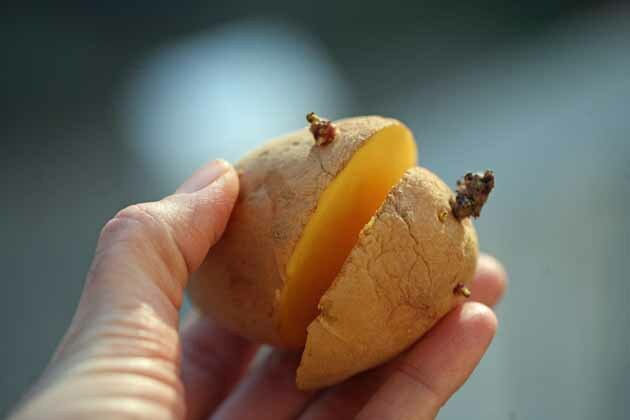 Dividing Seed Potatoes Before Planting – potatoes that are the size of a hen’s egg or smaller should be planted whole. Larger potatoes can be divided. To divide the potato, use a sharp knife and cut it into two or more pieces. What’s important is to make sure each part has at least one sprouts. According to The Potatoe garden, you can use multiplication of 10 to calculate how many lb of potatoes you need. 1lb of potatoes will probably include 5-8 potatoes, but since you will be able to divide some of them you can plant 10 feet with 1lb. 2lb of seed potatoes will plant 20 feet row, 3lb will plant 30 feet and so on. When to Plant Potatoes – the general rule is to plant potatoes 2 weeks before your last frost date. The best soil temperature for planting potatoes is 50F. You can check soil temperature by simply sticking your kitchen thermometer in the soil and reading the result. Potatoes are a cold weather crop (although there are verities that can handle heat better than others). Here in the South, zone 7b, I plant potatoes in the middle of March even though the last frost date is 4/15. Usually, in the middle of March the soil temperature is high enough, and planting a little early gives the potatoes a few more weeks to grow before the serious heat of July arrives (they need approximately 3 months). 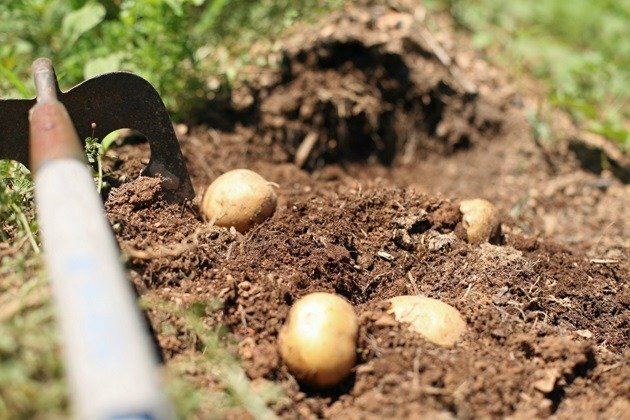 Where to Plant Potatoes – make sure to choose a location in full sun (8 hours). Whatever method of growing you choose (except hay) your soil should be very loose, high in organic matter, and well drained. If your soil is too heavy you can mix it with peat moss and lots of compost to loosen it (mix the top 8” of the soil). Best soil pH for potatoes is just like most other vegetables at 6.5. Planting Potatoes – whatever method you choose to use, make sure to plant the potatoes 6”-8” deep with the sprouts pointing upward. Space plants 12” from each other and if you plant in rows, for best results, space rows 30”-36” from each other. Watering – potatoes should receive about 1” of water a week. Measure the rainfall in your area on a weekly basis by using a rain gauge and if you didn’t get enough rain, water your plants. A trick that I read somewhere said to place an empty tuna can next to your plants and water until the can is full, this is how you’ll know you gave your plants an inch of water. 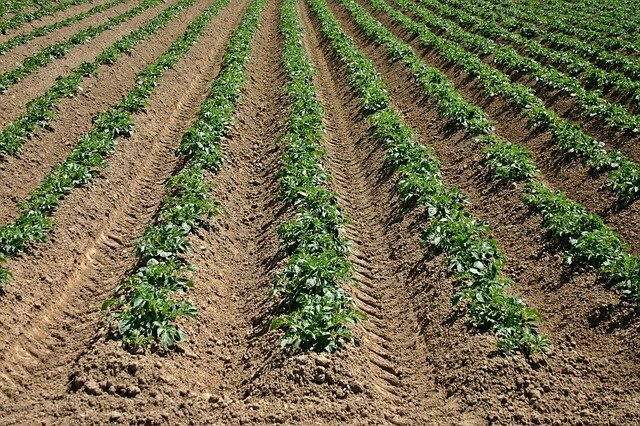 Hilling – hilling means to pile soil around the potato plants as they grow. This gives more room for tubers to grow and help increase the production from each plant. When your plants are 8” tall, hill them with soil you bring from both sides of the plant. Leave about 4” of the plant uncovered. Three weeks later hill again with an additional 3”-4” of soil. 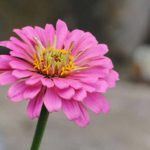 Fertilizing – aside from adding a lot of compost to the soil before planting the potatoes, I never use any other fertilizer. The Potato Garden sales a potato fertilizer that is called ACTON. You can read more about it in their catalog. And this one is an adult beetle. Pretty right? Sure, as long as it’s not eating your potatoes. This is one of my 2015 potato plants. I had a beautiful 100ft row of potatoes. A month and a half in, I started spotting the beetles. We tried picking them by hand but the battle was gone pretty fast. They ate the whole 100ft row. You can read more about what happened here. 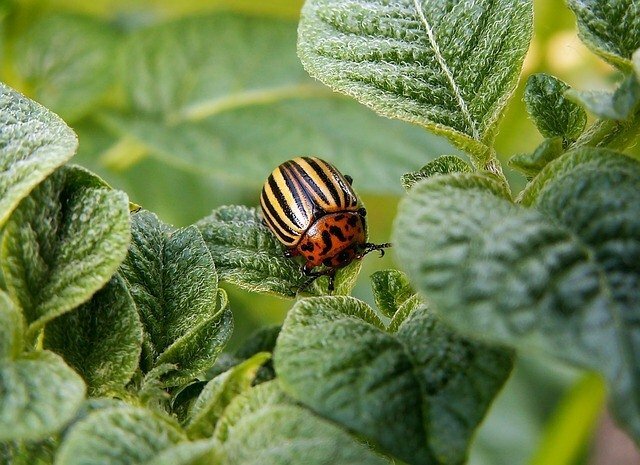 Those beetles over-winter in the soil so make sure to rotate your crop and not plant the potatoes in the same spot in the garden year after year. Other than the beetles, gophers can be a problem as well. I never had to deal with them but I know there are gopher traps, or a dog or a cat can be helpful too. How to Harvest Potatoes – somewhere in between 40-60 days, your potato plants will start blooming. Once they are blooming you can ‘rob’ the plants of new potatoes. Just dig gently at the edge of your hill and pick a few potatoes without disturbing the rest of the plant. 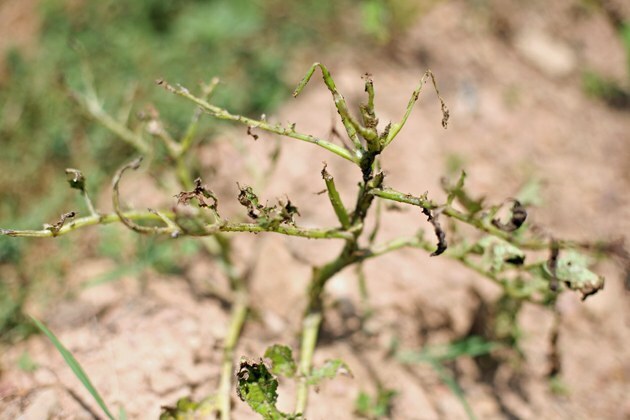 To harvest the main crop, wait until the vines are dead. Then leave the potatoes in the soil for two more weeks before you dig them up. This will give the skin time to cure and toughen. It is better to dig by hand (unless you plant many rows, then you’ll probably want the help of a tractor). You can use a hoe or a garden fork to loosen the soil but be careful not to stick them right through the potatoes and damage your crop. How to store Potatoes – use burlap bags, some kind of net, or baskets to store potatoes. It is important to allow air flow. Potatoes will last for around 6 months if stored at 40F (a crawl space of an unheated garage or shed can be a good option if you don’t have a root cellar). Make sure they are also stored in the dark. It is better to bring the potatoes to room temperature for a day or two before cooking them, this will allow them to get some of their starch back, just make sure you keep them out of the light. I love growing potatoes. You don’t have to deal with tiny seeds that make your eyes and fingers hurt. The plants are green and beautiful, the blossoms are purple or white and add some collor to the garden. You can plant them very early and store the crop for a long time. It really is a crop that every gardener should grow. I would love to hear about your experience with potatoes. What growing method do you use? What verities you grow? 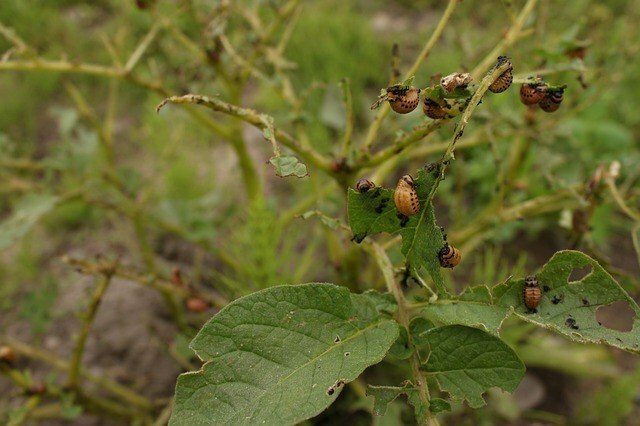 Did you ever have to deal with the colorado potato beetle? Where do you store your potatoes? I am very curious. Did you say you did not have to buy seed potatoes this year? How do you save seed potatoes? Thank you. So last year most of my potato crop was ruined because of the beetles, but I could still harvest some potatoes. We ate most of them but I saved about 20 for this year. The potato with the sprouts in the picture (where I show how to divide seed potatoes) is one of those I saved from last year. You supposed to keep them in dark and humid place at 40F. I couldn’t find such a place here so I wrapped the bag of potatoes and stored it in the bottom drawer of my refrigerator. I am not sure this is going to work (this is why I didn’t share it in the post), but I plan to take the potatoes out of the fridge a few days before planting, divide and plant. We’ll see what happens. I’ll keep you posted. I would have thought they would have completely shriveled by now in your fridge. PLEASE keep us updated on how they grow, harvest #s, etc. I have NEVER been able to keep my potatoes fresh – they always rot in the basement before we use them all 🙁 but the sweet potatoes do wonderfully. Maybe it’s not cold enough. I’ll have to get a thermometer to check. So you stored ALL of the potatoes you harvested in the fridge? Did you think they tasted different from those stored in the pantry or those from the store? No, at the beginning, after I harvested the potatoes, I kept them in the pantry. We ate all the bigger ones and I decided to keep the smaller potatoes as seed potatoes. After another month or so they started sprouting. It was way too soon and I wasn’t sure what to do. You are right, here in NC it is simply too warm for potatoes. So I was thinking I’ll try to keep them in the refrigerator and see what happens. I wrapped them and they are in the refrigerator for a few months now. The sprouts didn’t change, didn’t grow any more but didn’t die either, and the potatoes themselves look good. My plan is to take them out and leave them at room temperature for a few days before I plant. I am not sure if this is going to work, this is why I didn’t share it in the post. I’ll keep you updated. The Health Ranger said to use Neem as a pesticide. You can get that in the garden store. Thanks! I will try using it this year. If you have chickens let them free range for a day in the potato patch. They will take care of your beetle insect problems and you wont have to use any chemicals. You know, I was thinking about doing that but I wasn’t sure if the chickens will eat the green leaves of the potato plant. I know they like green stuff and that a lot of homesteaders have their garden fenced if the chickens are free around the homestead. I have six chickens, I’ll have to try this this season if I notice the bugs again. I wonder if guinea hens will be better for this job. I know they eat ticks and other bags but I need to research about them more. I plan to get a few when we move to our 20 acres. There are a lot of ticks here in NC during the summer. Potatoes are heavy eaters so you have to make sure they have plenty of compost and fertilizer. Also, make sure they are in full sun and that you use potting soil since you plan in bags.